Microsoft Sway is for creating online presentations and interactive reports. Sway content is presented online and has numerous ways to customise viewing and navigation even if you didn’t create the Sway yourself. If you have not used Sway before here is a Sway presentation example for you to view. When you open a Sway you will see the navigate button on the bottom right of the screen. The navigation menu allows you to explore an overview of the Sway based on headings (Heading One cards) alongside thumbnails of the section background images. The menu on the top right of the Sway provides options for customising how the content is presented. Click on the cog wheel to open the layout and play options. This allows you to change the layout for scrolling to either vertical or horizontal. You can also turn off animations from this menu. 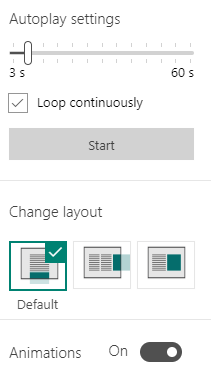 Sway provides an autoplay feature to loop the content continuously. 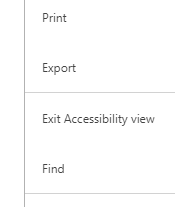 By clicking on the 3 dots on the top right of the Sway more options are available these include Accessibility View, Export and Print. Sway Accessibility mode will present a non-interactive view of the presentation that is readable by screen readers online. In accessibility view the colour scheme is changed to black and white for high contrast and the layout presented vertically. The layout is also simplified with grouped images presented separately and animation removed to avoid distractions. A useful feature that is activated in Accessibility view is Find this provides a Search box for you to search the text content of the Sway. Find is accessed from the 3 dots menu when Accessibility view is on. Sway provides the option to convert to PDF and Word for downloading. In converting the content the layout is similar to Accessibility view with vertical layout and grouped media presented on separate pages. Content can be edited in Word to adjust the font, presentation and layout. Print mode will convert the Sway into PDF for printing. If the layout is not satisfactory try converting to Word before printing.